the future will definitely be brighter." This is the thoughts that link us together. We deal with our own job with great responsibility. Naoki Makabe, entered in 2012, age 24. Stainless sash is different from Alumni sash which is standardized products, the former one is made from a steel plate through a custom-made process that cut the material into piece and bending. Therefore, it is not mass production that each one looks exactly the same. Moreover, our company not only produce stainless sash, but also metal handrails and ATM booth of the bank, etc. 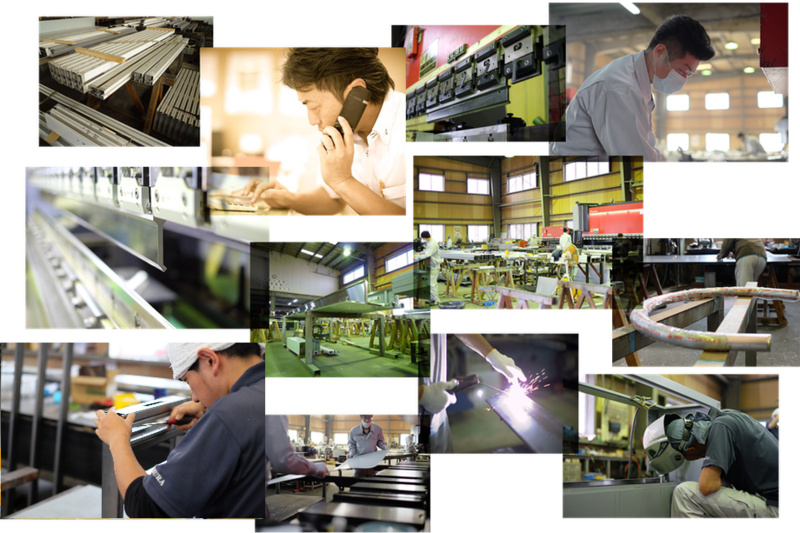 The products we produce are various. When facing this kind of job, I have to deal with different shapes of products and goods. This becomes a desire to conquer what I cannot achieve one by one, and to increase what I can do steadily. When I have ability to do more, it is possible for me to create products that last for decades shining at seeable places. I really think this is a wonderful job. Takaki Higuchi, entered in 2017, age 23. It was the first time I take part in jobs related to construction, so every day is new to me full of brand-new challenges. It is hard to remember all these new knowledges, but no matter what my question is, my colleagues around teach me from the very beginning. That is why I can keep learning happily under this kind of homey atmosphere. Non-experience in construction industry like me can also learn thoroughly here. Let’s make products that remain into the future together.